You may have heard that we need a new building for our Raleigh distribution center. Here’s some more information about how our Raleigh Branch works and why we are looking for a larger space. Six days a week, Food Bank staff and volunteers buzz around our Raleigh distribution center on Tarheel drive, working safely and efficiently to accept food donations and prepare them for distribution. Food Bank staff members drive ten forklifts to unload pallets of donated food from our partners, hundreds of volunteers sort through giant bins of produce, and 100 partner agencies comb through our aisles, picking up items they need for their food pantry or soup kitchen. 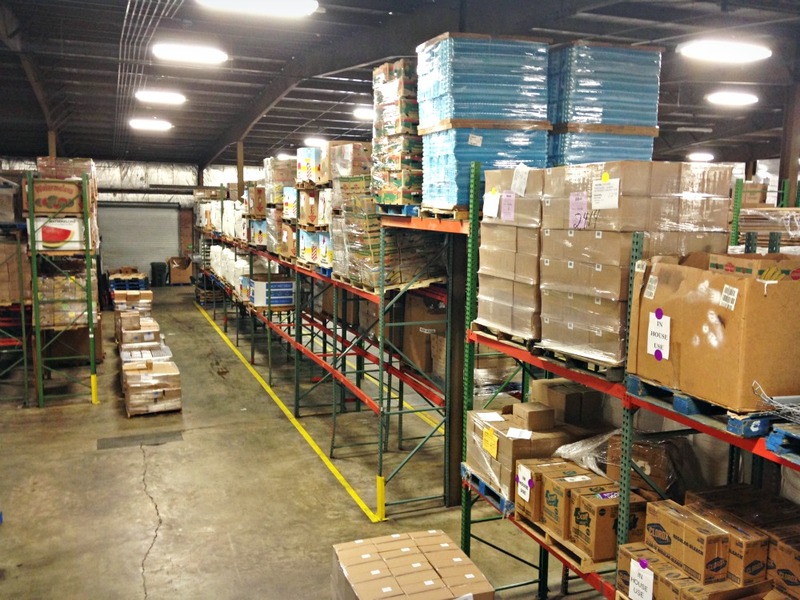 On average, nearly 150,000 pounds of food enters and leaves our Raleigh Branch every day. Without consistent donations, our 42,000 square-foot Raleigh Branch would be completely empty in less than two weeks. In many ways, our Raleigh Branch works as a hub for our entire 34 county service area. Through our distribution center on Tarheel drive, we not only provide hunger relief to the surrounding counties but also those served by our five other branches in Durham, Greenville, New Bern, Southern Pines, and Wilmington using our fleet of trucks. 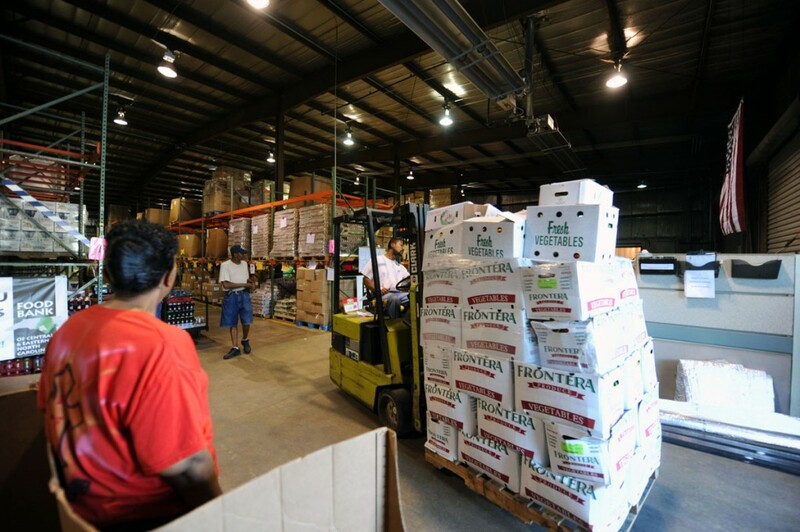 Almost half of all the food we distribute across our service area comes through the Raleigh Branch (28 million pounds, to be exact), and almost one third of that is ultimately transferred to other Food Bank branches. If you’ve ever visited our Raleigh Branch (and if you haven’t, we encourage you to do so! ), you know things move quickly. Our volunteers know that we will distribute the sweet potatoes they just sorted within a day or two. But they also see that it’s a large operation that requires many rigorous processes in place to safely serve a large population in need. 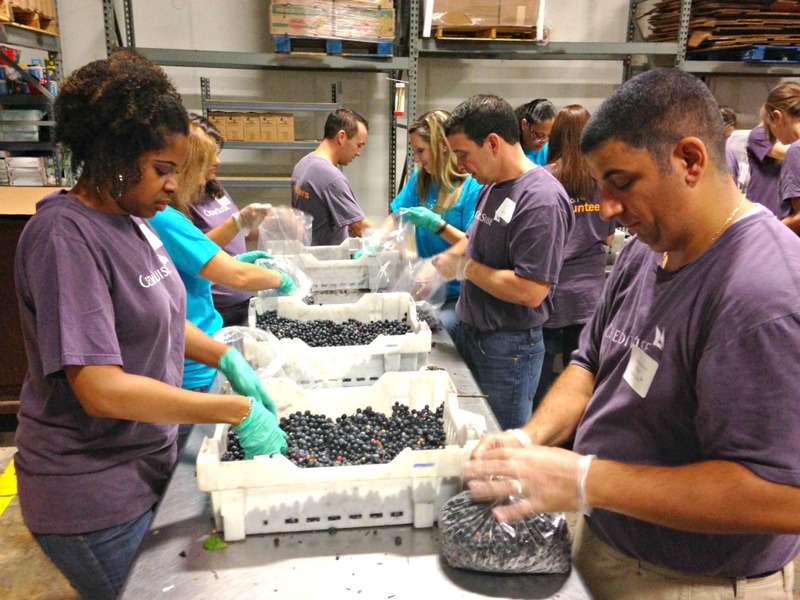 Volunteers carefully sort blueberries at our Raleigh Branch. On a daily basis we collect food donations from a variety of sources such as community food drives, grocery stores, and local farmers. For proper accountability and to follow food safety regulations, Food Bank staff takes inventory of the food items and either prepares it for volunteers (see step 3) or for distribution (skip to step 4). We also take care to store food properly at the necessary temperatures, be it at room temperature, in a cooler or a freezer. Volunteers prepare the food for distribution in various ways. For example, if they are preparing food drive donations, they carefully inspect each item, checking for compromised or expired food. When handling donations from a grocery store, they sort the items into categories, making them easier for our partner agencies to select. If they are preparing food donated by a local farmer, they sort through giant bins of fresh produce such as sweet potatoes, apples or cucumbers, and place items into family-sized bags. When the food is packaged properly and ready for distribution, our staff places it in designated areas for our partner agencies to pick up or loads it onto our Food Bank trucks to deliver to a partner agency or another Food Bank branch. 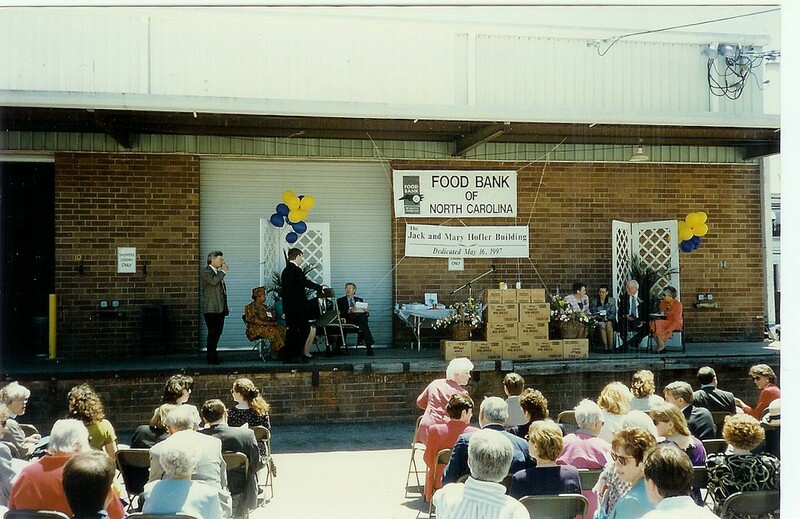 Photo from our Tarheel Drive building dedication ceremony on May 16, 1997. Every day we work to make this process more efficient. 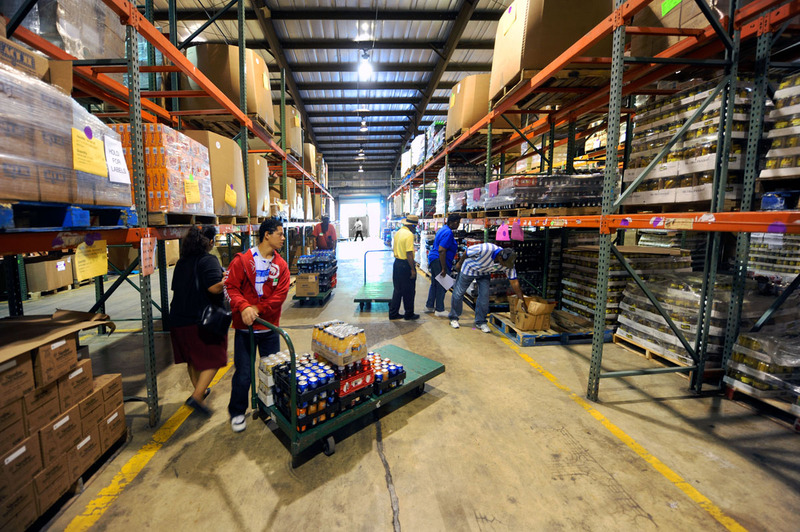 When we first moved to our Tarheel Drive distribution center 18 years ago, we distributed about 5 million pounds of food a year, 10 percent of which included perishable items such as fresh produce, meat, and dairy. Now we distribute over 53 million pounds a year, half of which includes perishable food. And that’s important because the need across our region continues to grow. In the past 18 years, the number of those at risk of hunger has almost doubled. Now more than 651,000 people across our 34 county service area struggle to access adequate amounts of food necessary for an active and healthy life. Our Raleigh Branch today, with pallets of food tagged and prepared for distribution. So why do we need a new building? As workers in hunger relief, we know that our current operation does not fit in our Tarheel facility anymore. Many of our staff and operations have already been forced to move off-site to other offices or warehouse buildings because our current space simply cannot accommodate them. We have also maxed out our volunteer capacity. Volunteers sort a large percentage of produce donations, and we need more space to fit more volunteers so that we can distribute more fresh and nutritious food. And we know a new building will help. Last April we moved into a new Durham Branch location, expanding from an 18,000 to a 29,000-square-foot building. Since our move we’ve been able to distribute 725,000 more pounds of food in the first half of the fiscal year than the year before. We’ve been able to accommodate larger volunteer groups, accept more food donations, and serve more partner agencies. And we expect those numbers will continue to grow. As leaders in hunger relief, we must look to the future and plan ahead in order to remain a strong resource for the community and serve as many families as possible. Our Raleigh distribution center represents a vibrant community of donors, volunteers, and folks who dedicate their lives to hunger relief. It serves not just as a hub for food distribution, but also as a place for our community to drop off food drive donations, a pick up location for our partner agencies, a space for volunteers to give back, and our headquarters for critical Food Bank programs such as Kids Meals & More and Three Squares for CENC. On one hand we solemnly recognize that we are growing in size because the need is growing so great. But on the other hand, we feel resolved to continue our work and grow stronger than ever in our fight against hunger.